The Thirty-Nine Steps was written by John Buchan and published in 1915. It was one of the first “conspiracy” spy thrillers, and is regularly voted one of the top ten spy thrillers of all time. It is 1914, just before the outbreak of World War One. Richard Hannay returns to London, having made his fortune in Africa. Hannay meets a man who claims to be investigating a German spy ring known as the Black Stone. Hannay lets the man hide in his flat, but later finds him murdered. He fears the Black Stone will come for him next, as the murdered man had given him a notebook for safe-keeping before his death. Reasoning that the police will arrest him for the murder, Hannay decides to go into hiding in his native Scotland. He escapes dressed as a milkman and takes the train to Scotland. Hannay cracks the code in the notebook. It describes a German plan to start the coming war with a bolt-from-the-blue attack on the Royal Navy. The Black Stone are responsible for enabling the attack by stealing a document showing the Royal Navy’s dispositions. The phrase “The Thirty-Nine Steps” is prominent in the notebook, but without explanation. Hannay is pursued by an aeroplane, by policemen and by groups of the Black Stone’s men searching for him. Every time they get close, he has a lucky escape. He also meets a local landowner who believes his story and writes an introductory letter to a contact at the Foreign Office. Eventually, the Black Stone captures Hannay. Luckily, the room they lock him in contains explosives and he blasts himself out. The iconic image of The Thirty-Nine Steps is the man on the run. I loved the “staring in to the sun” feel of the silhouette and the lens flare. I thought reversing out the title balanced a cover that was bottom heavy otherwise, due to the plainness of the background. The Thirty-Nine Steps was the prototype of the ‘conspiracy’ sub-genre of the spy thriller (see Spy Novel Plots). Witnesses an inciting incident by a group of Conspirators headed by an unknown Antagonist. Realises they are not safe from the Conspirators. Is also not safe from the authorities, as they are tricked or infiltrated by the Conspirators. Goes the run, pursued by both the Conspirators and the authorities. Involves one or more Allies in their escape (Optionally there is romance subplot with one of the Allies). Narrowly avoids capture and death (or is captured and escapes) by both the Conspirators and the authorities. Works out who the Conspirators are. Persuades the authorities they should work together to stop the Conspirators. Confronts the Conspirators, unmasks the Antagonist and stops (or fails to stop) the Conspiracy. Six Days of the Condor and North By Northwest both follow the Conspiracy plot formula pioneered by The Thirty Nine Steps. Reading the plot summary above, it’s clear that The Thirty-Nine Steps relies mostly on fast pace to hold the reader’s interest. It was written originally for serial publication in Blackwood’s Magazine and shows that origin in being only novella length – around thirty thousand words. The thing with serials is things have to happen. Each chapter has a physical or mental problem for Hannay to solve and ends in a cliffhanger; the narrative drive is relentless. Hannay’s miraculous ability to escape from impossible situations through coincidence, the intervention of previously unmentioned people, and pure luck makes it hard to take his jeopardy seriously. Buchan himself did not regard his ‘shockers’ as his best work, and also wrote non-fiction and more literary novels. The writing is a hell of a lot better than the hackneyed prose of William Le Queux though. Of course, the language and the character’s attitudes are from a bygone age; the novel was written just before the First World War. That old-fashioned Britishness is part of the story’s charm, just as it is in the The Riddle of the Sands. Hannay’s ability to escape traps through pure luck stretches credibility to breaking point for the modern reader. However, with its huge narrative drive The Thirty-Nine Steps showed the way the spy thriller had to develop. It remains a fun, quick read and well worth an afternoon’s attention. 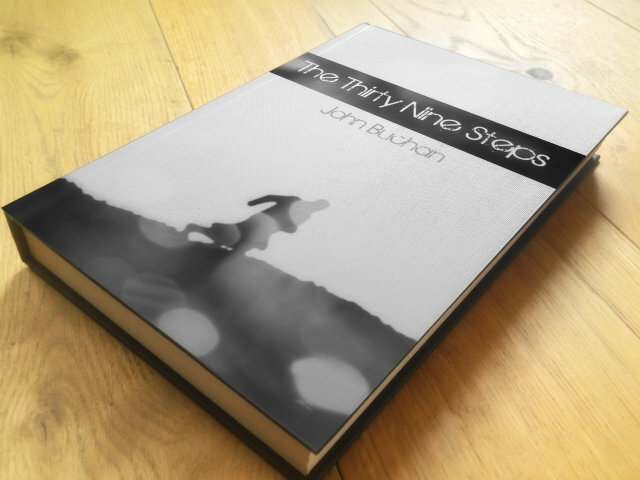 The Thirty-Nine Steps is a perennial favourite for movie adaptations, having been dramatised many times for film, television, radio and theatre. The Thirty-Nine Steps was also remade in 1959, 1978 and 2008. None of the other filmed versions of have been particularly faithful to the book either. They all change the secret the Black Stone have stolen, the major characters other than Hannay, the nature of the ‘thirty-nine steps’, or other key details. This is a symptom of the fact that the original book has a high concept, but the ending is neither action-packed nor visual enough. The Thirty-Nine Steps novel is available at Project Gutenberg here. The Hitchcock movie version is available on Amazon US here, and Amazon UK here. If you’d like to discuss anything in my review, please email me. Otherwise, feel free to share it using the buttons below.